SINGAPORE, 27 January 2016 – Singapore Changi Airport capped a resilient performance in 2015 with new benchmarks for passenger traffic and aircraft movements, handling a record 55.4 million passengers and 346,330 landings and take-offs during the year. This represented an increase of 2.5% and 1.4% respectively. On the cargo front, airfreight movements remained stable at 1.85 million tonnes for the year. 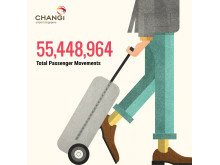 In December 2015, Changi Airport registered a total of 5.29 million passenger movements (+3.9% on-year), the highest ever traffic the airport has achieved in a month since it opened in 1981. Changi Airport’s daily record was also broken on the Saturday before Christmas (19 December 2015), with more than 192,000 passengers passing through during the 24 hours. 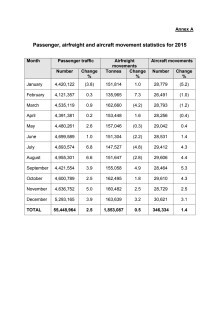 The monthly breakdown for passenger, airfreight and aircraft movements at Changi Airport in 2015 is in Annex A. 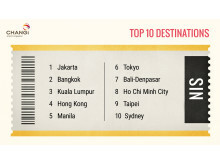 Traffic was positive for most of Changi Airport’s top 10 country markets with Thailand (+12.5%), Vietnam (+7.2%) and China (+7.0%) registering the strongest growth. This was offset by a softer showing for Indonesia (-7.3%) and Hong Kong (-1.2%). While the broader trend for air travel was positive, traffic to Singapore was impacted by the strength of the Singapore Dollar against some regional currencies. 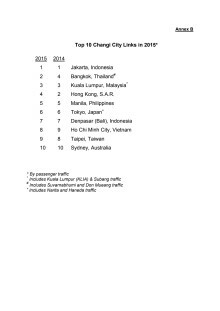 In terms of Changi Airport’s busiest routes, Jakarta continued to top the list with 3.79 million passenger movements last year, followed by Bangkok, Kuala Lumpur, Hong Kong and Manila (see Annex B). Bangkok was Changi’s second fastest growing route among destinations with at least half a million passengers handled in 2015. 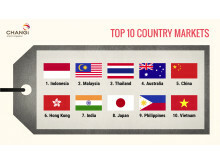 Colombo, Guangzhou, Mumbai and Tokyo rounded up the top five. During the year, eight new carriers commenced operations at Changi Airport. 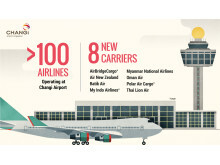 The return of Air New Zealand boosted capacity on the Singapore-Auckland route while the addition of Batik Air, Thai Lion Air and Myanmar National Airlines strengthened Changi’s connectivity within Southeast Asia. Oman Air also launched flight operations to Singapore, with a daily service to its capital city of Muscat, a new city link for Changi. Three other airlines (My Indo Airlines, Polar Air Cargo and AirBridgeCargo) enhanced Changi’s cargo network. 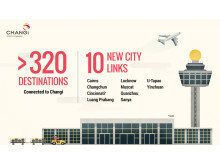 Changi Airport added 10 new destinations in 2015, highlighted by four new Chinese city links (Changchun, Quanzhou, Sanya and Yinchuan), strengthening the airport’s position as the most connected airport in Southeast Asia to China, with a total of 32 city links to the country. Besides the Chinese cities and Muscat, Changi also saw new services to Cairns in Australia, Lucknow in India, Luang Prabang in Laos, Pattaya (U-Tapao) in Thailand and Cincinnati in the United States, a new freighter link. 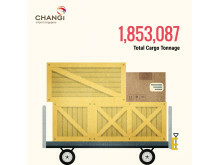 While Changi Airport’s total cargo throughput was little changed at 1.85 million tonnes for the year, there were pockets of growth in niche cargo segments. For instance, there was strong double-digit growth in the pharmaceuticals cargo segment, which registered a 44% growth on-year in 2015. Supporting the growth of the express cargo segment, Changi Airport Group and DHL Express announced plans in March 2015 to build a 24-hour express facility at the Changi Airfreight Centre that will be completed later in 2016 to support the growth of trade within the region. The new facility would increase DHL’s throughput by three times and processing speed by six times, and further anchors Changi Airport’s position as a key cargo and logistics hub in Asia. 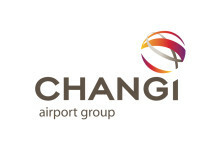 Changi Airport received its 500th Best Airport award in November 2015 and this milestone rounded up another year of excellence during which Changi clinched a total of 28 ‘Best Airport’ awards, including the World’s Best Airport accolade at the 2015 Skytrax World Airport Awards, an honour Changi achieved for the third year in a row and the sixth time in its history. 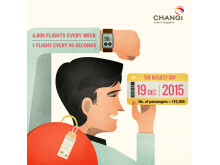 Changi Airport Group CEO Mr Lee Seow Hiang, said, “2015 was a year of two halves for Changi Airport. Following 2014, which saw a number of airline incidents in the region and depressed yields for many regional carriers, we had a relatively weak first six months with flat growth for the period. Nevertheless, we pressed on to actively woo new airlines and seek growth opportunities with existing ones, and our efforts have yielded some positive outcomes. We have seen both full-service and low-cost carriers add capacity in recent months and this has resulted in stronger passenger growth of about 5% for the second half of the year. “Going forward, economic uncertainty in many markets, made worse by lacklustre business and consumer confidence, may dampen travel demand in the near term. However, low fuel prices should support airlines’ profitability. The outlook for Changi is also bolstered by positive developments such as the addition of new city links and airlines in the coming months. These include Singapore Airlines’ new services to Dusseldorf, Canberra and Wellington in the second half of this year, as well as the arrival of Fiji Airways’ new direct service from Nadi in April. 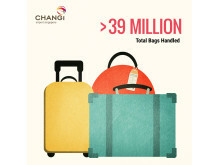 Changi Airport is the world's seventh busiest airport for international traffic. It served a record 55.4 million passengers from around the globe in 2015. More than 350 retail stores and 160 F&B outlets are situated across three terminals to cater to passengers and visitors. 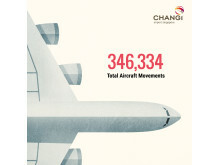 With over 100 airlines providing connectivity to 320 cities worldwide, Changi Airport handles about 6,800 flights every week, or about one every 90 seconds.